The CE-TECH Nail-In Video Cable Clips (20-Pack) are designed for both new or replaCE-TECHment installation. The clips feature solid construction and are compatible with almost all brands. Digiwave RG621100BF RG6 Coaxial Cable is professional-quality cable with 18 gauge copper clad steel center conductor. Cable also swept-tested to 3000MHz(3GHz). This cable heavily 60% shielded with 100% foiled to minimize interference. Copper clad steel conductor maxima the cable length you can run. Cable is ready for use with F connector installed. Coaxial Cable Nail-In Clips in White (20-Pack) The CE-TECH Nail-In Video Cable Clips (20-Pack) are designed for both new or replaCE-TECHment installation. The clips feature solid construction and are compatible with almost all brands. 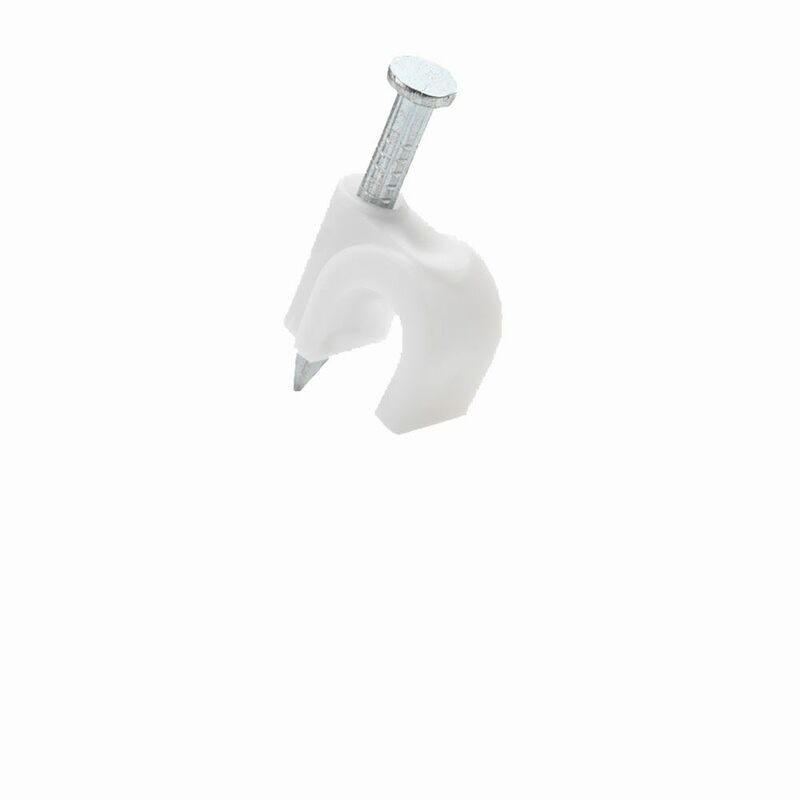 Coaxial Cable Nail-In Clips in White (20-Pack) is rated 4.3 out of 5 by 8. Rated 4 out of 5 by AnneWhite from If I had to install coaxial cable along my baseboards and around door frames, again, I would get ... If I had to install coaxial cable along my baseboards and around door frames, again, I would get the staple gun the cable companies use, instead of this product. You have to use a lot of these to keep the cable wire from sagging, and it is tricky to hit the nail on the head with every pound you do, and when you miss, you mess up your wooden baseboard or door trim. I switched to a daintier hammer after a few misses, but still not happy with the overall aesthetic. Staples are less visible, cause less damage to trim when installing, and you can use more of them, for a tighter and neater finished look. Rated 5 out of 5 by Fer from i love this small clips they hide and hold the... i love this small clips they hide and hold the cables. Rated 5 out of 5 by Joseph from The clips helped make the cables in my home more... The clips helped make the cables in my home more tidy and organized. Rated 5 out of 5 by AMiller from Flexible enough to fit larger gauge electrical wiring as well as coax or cat-5/6. They are exactl... Flexible enough to fit larger gauge electrical wiring as well as coax or cat-5/6. They are exactly what they say the are. Rated 5 out of 5 by Vlad from Great product!... Great product! Rated 1 out of 5 by Kyle from Not for RG-6 Quad Shield. Cmon Home Depot!! If you're running RG-6, don't go to Home Depot for supplies, as they do not carry, or stock what you will need. I'm giving his a poor review because Home Depot no longer seems to carry the larger clips that they previously carried for larger diameter coax cable, such as RG-6 Quad. A week earlier, I found a wider clip that worked perfectly. I need more to finish the job, and even on the website they are no longer carried, or in stock. I was forced to try these, and like I figured, they're not big enough to fit the larger cable. Now I have a half finished project, and I'm forced to shop elsewhere. Really, this is a poor reflection on Home Depot, and not the clip manufacturer. The wider clips from the same manufacterer worked fine, so I would assume that these should work just as well for smaller diameter cables. Home Depot needs to get the larger clips back in stock, as this has been a large waste of my time. NOT A happy customer.